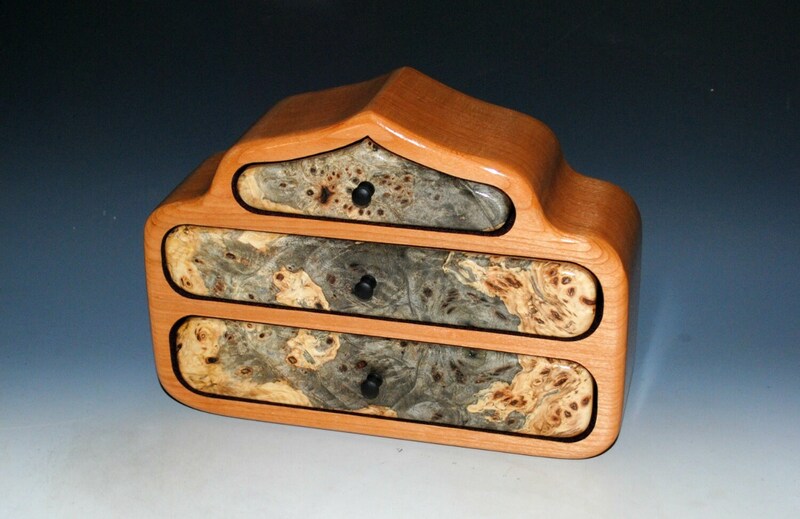 TriOval Style Wooden Jewelry Box of Buckeye Burl on Cherry - Art Box With Function Handmade by BurlWoodBox in the USA - A Unqiue Gift ! Buckeye Burl on Cherry Two Drawer Wooden Jewelry Box - Handmade Wood Box by BurlWoodBox - Unique Gift ! Tiny Wooden Box of Mahogany & Buckeye Burl Handmade by BurlWoodBox - Cute Little Gift Box ! Fantastic box, superb craftsmanship, and such amazing responsiveness to my request for an engraving with a fast turnaround. Thank you so much for such a wonderful gift! Small Wooden Jewelry Box of Mahogany And Redwood Burl With Three Drawers - Handmade Gift!